Could the special be penne with sausages and meatballs in our house made red sauce and with a Caesar salad or Coconut and Panko encrusted fish tacos with a black been and mango salsa, cilantro jasmine lime rice with smokey black beans? How did this all happen? Tara worked for 8 years at the Inly School and watched busy parents pick up their children in the evening, and knew that there was a need for parents to have nutritious, healthy options for dinner – something that wasn’t always happening in their busy lives. Tara’s next adventure was doing in home daycare where she started making take home dinners for the parents. When she moved to Norwell, the parents followed her, and she knew she had something. For the next few years Tara used various commercial kitchens to continue her work, sometimes getting up at 3 in the morning or having to travel to Plymouth. Soon, she had Ron her husband a remodeling professional, build a commercial kitchen off their house in Norwell. 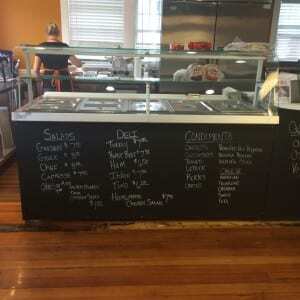 After that, things took off, more catering, meal services, and in 2008 her first café in Braintree. 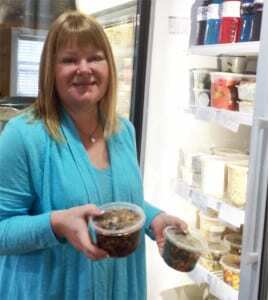 In the next two years she would also start a wholesale freezer food service, and she is currently in 3 stores, Shields in Norwell, Brant Rock Market in Marshfield, and Sharon Market in Sharon . June 1st will be the beginnings of the Bakery part of her Take Out Restaurant and Bakery, and within the next year she hopes to have a new location in some lucky town on the South Shore. Tara loves that her first store front location is in Norwell, she love employing local kids, and giving back to the local charities. Calles Run is especially dear to her, but she has donated her time and goods to the Norwell Women’s Club as well as other local groups. When she has some spare time you will Tara find her camping or boating on the North River with her husband Ron, her 2 girls, Anna & Sofia, and of course their dog Maggie.